We returned from Kentucky to a persistently rainy February in the Golden State. Total precip was only 2.25″, but it rained 20 days out of the month. Great for gardens and filling reservoirs, not so good for wall-builders. Then March arrived with a hint of lamb, beautiful, warm and sunny, promising weeks of perfect projecting weather. That all changed the next day. So it goes. Of the last 8 weekends, we’ve had rainstorms during six. Now, there’s nothing wrong with a little rain in southern California – water being the precious, disappearing resource that it is here – but damnit, Jim, I wish it would pour during the work week, so all us movers of soil can get something done on our few days off. Even so, despite the weather I’ve made slow, steady progress on the back hill terrace building since we returned from the Farm, mostly in the hour or so of daylight after work, since the weekends have been wet, very wet. As you can see, the second wall’s done, but the hard part of building the second terrace is still ahead. There’s still an awful lot of ice plant to pull out and shred, and the hill is steeper here than at the bottom, which means there’s more soil to remove. I’m slowly working away at both. 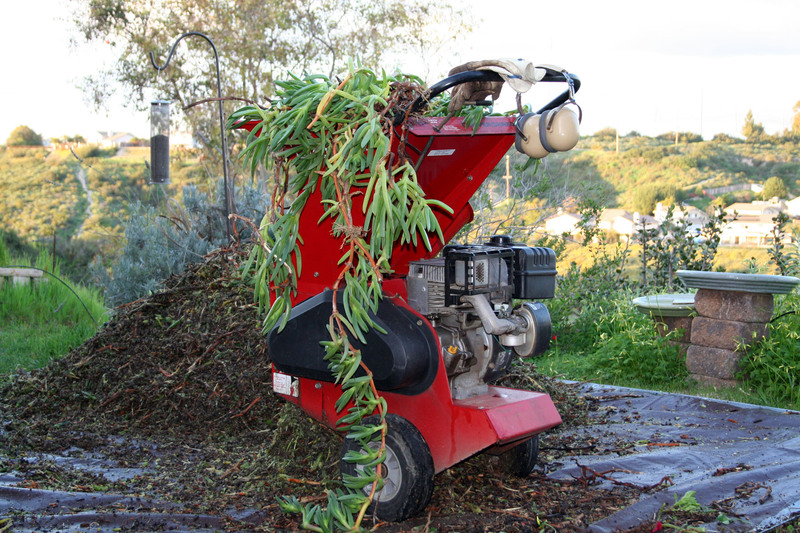 With the help of my trusty Troy-bilt chipper-shredder, Chewie (named after the Star Wars Chewbaca), I am turning tons of overgrown ice plant into shredded mulch and building compost piles, lots of them. I’m not sure how I would accomplish this project without the ability to convert this enormous volume of plant material into something useable, as there is so much of it, and the backyard is very small. Disposing of garden trimmings here in suburbia usually means leaving bins out curbside for the collection trucks, but with Chewie at my service I’ve never had to let a single branch or pile of leaves go to waste. This project is, however, the most he’s had to contend with, and it’s slow going, feeding the tangled, fleshy vines and old roots through. But we’re getting there. Moving the dirt is slow work, too. Like the Incas building their high mountain terrace gardens in the Andes, I am carving out and hauling away the overburden by hand, in trugs, some of it going downhill to widen and level out the bottom edge, but most of it will have to be walked up the steps to the top of the yard, and piled somewhere until I figure out how much I will need for fill and what will be excess to give away. The few inches of topsoil is getting peeled off before digging out the decomposed granite, to add to my stockpile of topsoil for the growing areas once construction is done. So the routine has been going like this: I escape the squadron as early as I reasonably can, drive 40 minutes home through freeway traffic, and head straight out back for an hour or so of work before daylight is gone. Once it gets dark, it’s time to make dinner, wash up dishes, and drag myself to bed. Every little bit helps, believe me – last night I carved out another four feet at the curved corner, and I’m hoping to get enough of the second bed leveled this week to have room to stack the next order of blocks on Monday. This weekend is Drill Weekend for the Reservists, so we’ll work straight through. It’ll probably be beautiful and sunny, too! Just my luck. But every morning I take a cup of coffee down to the first level and sit to watch the dawn break over the canyon, and listen to the birds start to wake up and begin their songs, and I’m newly energized to do whatever little bit I can do that day, even if it’s just a few loads of dirt or a couple of trugs filled with ice plant hiked up the hill. Because I can see the finished project in my mind’s eye, and remember what the hill looked like before I started, and I’m endlessly fascinated by the process of transforming the one thing into the other. I could pay someone to do this, but it wouldn’t be the same. Well! Excellent progress. You posted the completion of the first wall just a bit more than a month ago and you went to Kentucky, too! So …. a big round of applause! That’s a lot of hard work there, laying retaining wall block. And you’ve gotten almost all of the ice plant cleared out, too. I imagine the hard part will be to create soil beds for your veggies, though, what with all the disturbance going on. Saving the topsoil will be a big help, but still …. How many terraces will you have? Three? When is the growing season in California? Will you be able to garden this year in the new beds? Thanks, Jeff! Posting these updates really helps me to see the progress accumulate and keep the entire project in perspective. I have quite a bit of good garden soil stockpiled, and along with the few inches salvaged from under the ice plant, hope to have enough to fill in all three terrace beds to a depth of about 16″. I’m digging them out after the granite fill has had time to compact and settle, and leaving a foot or so undisturbed directly in front of the wall, as well as 4 – 6″ behind the blocks on the other side, as walking space. 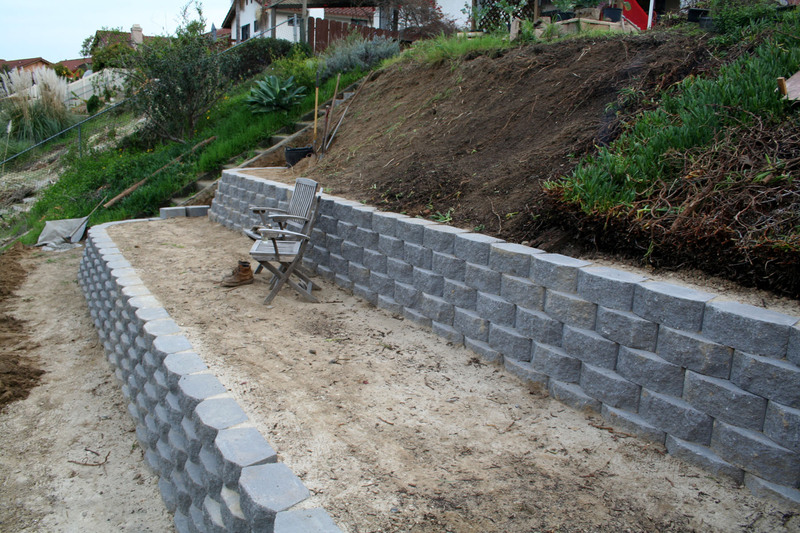 So the garden bed itself will only be about 3.5 feet wide… plenty of room for square-foot gardening, though! And yes, I’m planning on growing in them this year; gardening in California is nearly a year-round proposition, so as soon as I can get plants started and the soil prepared, we’re off to the races. I’m working out a rotation plan, hoping to make best use of space, trying to decide how much of what to grow. This will be the most growing space I’ve ever had to work with! I bet once your neighbors see all the lovely veges you harvest from your terraces, they won’t look at you so strangely anymore. In fact, they’ll probably be really jealous, and do a little landscaping of their own!